The smartphone segment has come leaps and bound over the last 2-3 years in the country. What was earlier regarded as a niche product category has made its foray into the top 10 segments in the country. Retail has played a vital role in establishing this status. The changes that one foresees in this segment have been at regular intervals, which has primarily been due to the vastly-competitive mobile market. 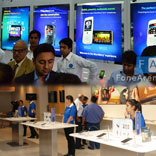 Recently we have seen brands like Samsung, Blackberry bringing out their experience zones in the country. Is this an emerging trend or change in the strategy of the brands? We figure this out. Leading experts in retail tell us that the mobile segment is highly-competitive and it is essential that the means to reach out to the consumer is undertaken in most viable manner. The Samsung mobile brand store is a significant step in the direction of creating a new, unique and holistic product experience for consumers at the retail level”, informs Ranjit Yadav, Country Head, Samsung Mobile & IT. The biggest takeaway from this format is engaging with the customer interactively, providing the customer’s know- how of the product, which helps them understand the product of their needs. The convergent products, i.e., Tablets, Smartphones, Phablets (tablet + phone), etc thrive in such experiential environment and hence the idea to provide these stores by Samsung and Blackberry seems viable as per analyst. “We believe that the time to experiment with retail format in the country is here and customer is mature enough about the products that we offer”, says Blackberry representative. For brands like Samsung and Blackberry, who have market share of 40 per cent and 15 per cent respectively, the strategy is to keep the stranglehold in the segment or even better the position. India is an extremely important market and mobile brands project growth rate of 25-30 per cent in India this year. “In terms of our retailing strategy, we are aggressively looking at increasing our network of Smartphone Café’s and will be opening a brand store in every Indian metro in the next one year” Yadav adds. Blackberry hopes to provide customers the opportunity to discover the BlackBerry experience within special zones featuring consumer and enterprise applications along with product service. There is also a demo zone to highlight usability of their phones. Further such premium stores are expected in metros later this year. The concept of experience store has been already utilised by Apple in the country with iWorld, which is Apple Premium Re-seller (APR) in the country. Since 2005, the brand has four outlets in the North region. By now every mobile OEM present in India has realised the growth of young earning mass, who are tech-savvy and well informed about the latest gadgets in the market. So when we ask who they plan to target with these experience stores, surprisingly the response is the opposite. “We understand that our main consumer is the youth but we also realise that there is a significant chunk of the mass that comes after this group. We believe that Blackberry has lost out primarily because it was considered a technical phone. Our latest attempts are in-place to shed of the tag”, says the Blackberry spokesperson. offline store formats for now. Experience zones are a breath of fresh trend in the retail area for mobile phones and here to stay. At present, Samsung operates through franchisees and has more than 260 smartphone cafes across the country and plans to set up experience brand zones in top cities in the country every year. The brand store and the Samsung Smartphone Café’s are managed by a specially trained team of professionals who are well versed with all the products and can advise the consumers of the products best suited for them as per their requirements. Meanwhile, iWorld has Apple authorised service centres wherein the engineers are certified for Mac and iPod. The staff is updated about the products on fortnightly basis. These concept stores are initially being positioned in the top 10 cities of the country and further expansion will be planned later.